RTD's new driverless shuttle at a bus stop. Photo: RTD. At a ceremony yesterday, officials revealed the robot bus. Photo: RTD. 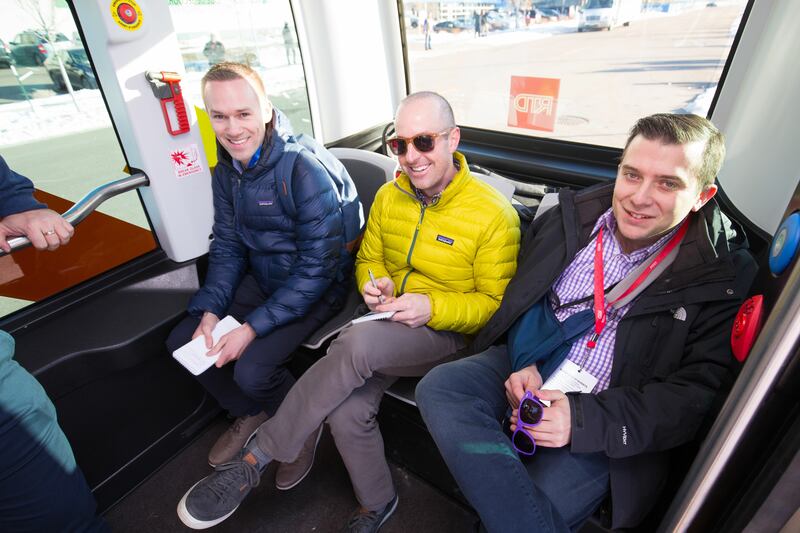 Yesterday, the Regional Transportation District kicked off the first-ever passenger service on a driverless electric bus in Colorado. 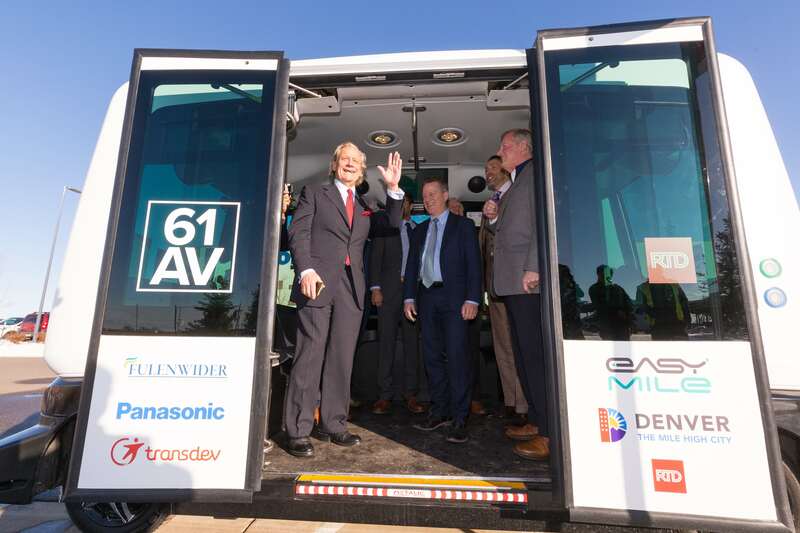 The little, futuristic-looking bus will carry up to 12 passengers at a time along RTD’s newest route, the 61AV. 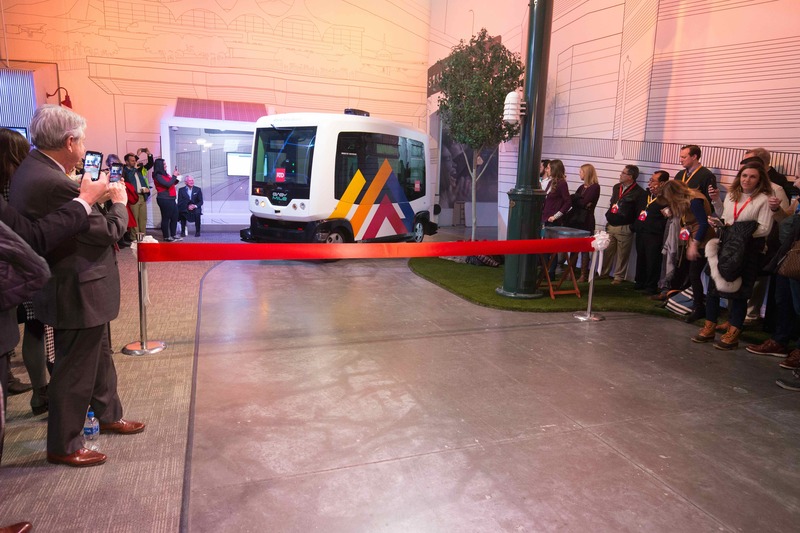 It will originate at the Peña Boulevard transit station, go to a Park-n-Ride facility and hit three stops within the sparse Panasonic “smart city” campus near DIA. Rides will be free during the six-month trial period. Service will be every 15 minutes. 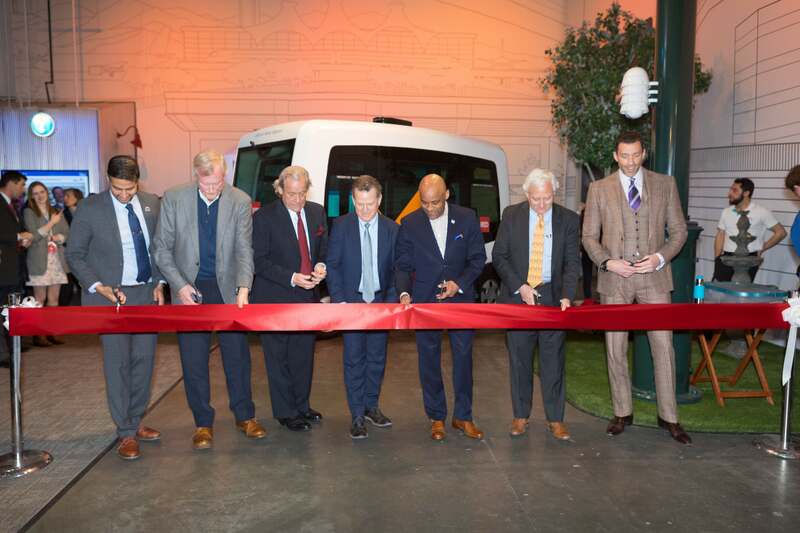 Mayor Hancock and officials cut a ribbon before launching the new service. Photo: RTD. 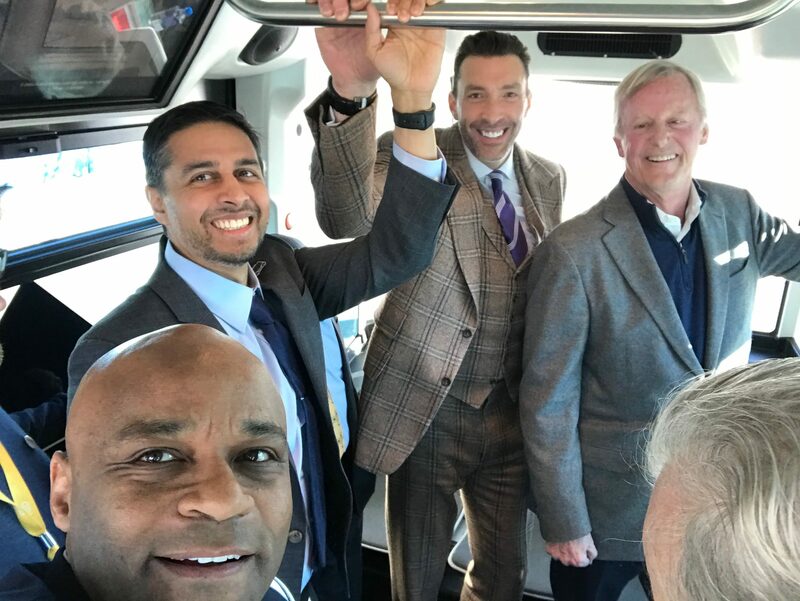 After a ribbon cutting ceremony, Denver Mayor Michael Hanccock was among the first to ride RTD’s newest route, the the 61AV. Officials after boarding the vehicle for its maiden voyage. Photo: RTD. 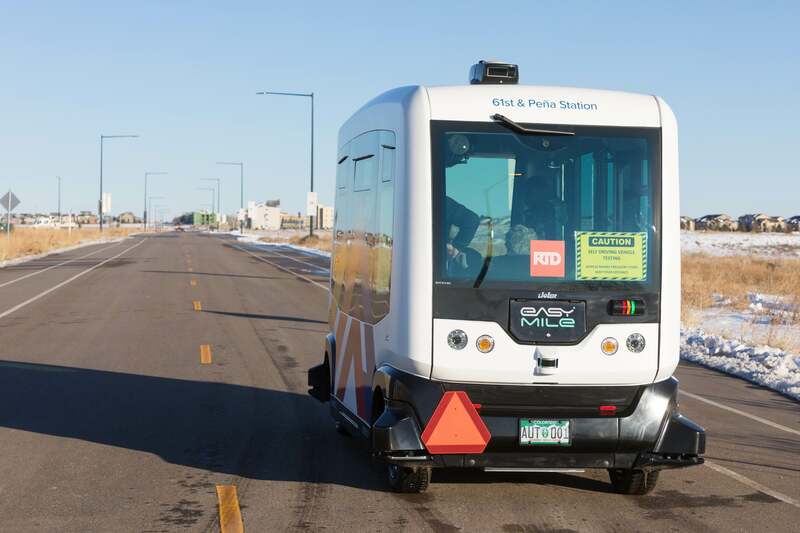 The vehicle, which is part of a six-month pilot project, will not be useful to many people as it circulates around a virtually empty tract of land near Denver International Airport. But the new mobility option could one day get people out of cars and onto buses and trains by connecting transit stops to destinations too far to walk. Doug Tisdale, RTD Chair. Photo: Michael B. Hancock. 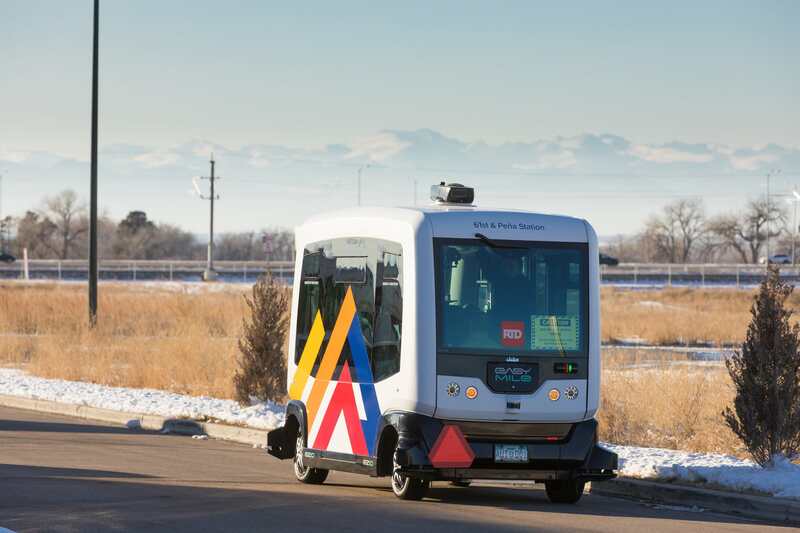 “We’re excited to see how driverless technology will work in Denver and to embrace new, innovative and better mobility options to move more people and improve travel for residents and visitors alike,” Mayor Hancock said in a press release. The robot-bus drives on city streets. Video: Denver Department of Public Works. RTD’s graphic treatment for the bus references the Rocky Mountains, which can be seen in the background. Photo: RTD. EasyMile, which makes the autonomous vehicle, says it has been tested over 200,000 miles in 22 counties and transported over 320,000 people with no accidents or injuries. Though no other cars are present, the autonomous vehicle can operate in mixed traffic. Photo: RTD. Even on its first day of passenger service, some riders were able to find a seat. Photo: RTD. Get Streetsblog Denver’s round up of daily transportation headlines delivered to your inbox. Sign up for our daily e-mail digest. I was there! Granted, it was the day after, but it’s still an interesting vehicle. Right now it still reqiures an operator, but even with an operator I’m confident that this technology will play a big part in solving the driver shortage. Then again, the technology needs to advance first. One of the advances that needs to happen is that it needs to speed up. The average apeed is waaaay too slow.